Skype has been popping up to my attention after a long time of being idle in background. I like Skype in general, it is a good way of staying in touch and making cheap calls to friends & family in Europe and rest of the world. The software is free, rarely give me any hassle. Of course there are always a few things on the wish list of improvements, like spell check on the IM and open up the IM platform so that it can be incorporated into other service. I don’t know about your ways, but for IMs I have Skype on plus Pidgin that incl Gtalk, Yahoo, AIM etc. Why not be able to add Skype too? I went to a research / focus group for Skype. I can’t tell you what they showed but I can say I was not so impressed by it. Not much innovation. In fact, what I missed was an Skype application that I could download and use it on my mobile / cell phone. I have used it for awhile and I like it despite it sometimes mini-freezes the phone and I have not been able to get my SkypeIn number to work. 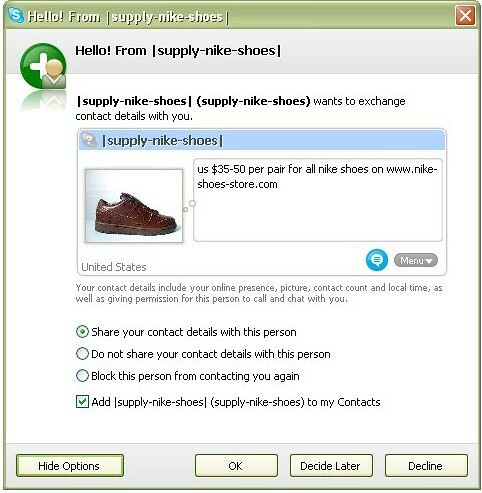 The last bit of Skype action, received yesterday, was a sneaky sneakers ad. A try to some innovative advertising or maybe a scam – I didn’t bother to find out. Blocked and Declined. I am not in a full blog mode at the moment. During the day, a thought of blog post pop ups and then it fades away. It is a strange mix with being busy of everyday things and nothing exciting happening. There was some unforeseen moving out expense, like we got slammed with a expense for 6 hours painting the wall. WTF? I think that came after I went down and talked to the manager about not-mentioned carpet cleaning expense. *Ugh* so glad to be out that place now. Last week, I saw Sicko. I had whole blog post in my head but … but anyway, my take is that the US system has forgotten all about the human care. Like volunteers in 11 Sept aftermath not getting the proper health care – absolutely no excuse for that kind of treatment. This film is more then not-suitable health system, it is also showing the official representation of the US’s ‘enemies’. The film scratches the surface and the baddies are not 100% bad as they made out to be. Who gains from that? It is a film worth watching. In the intermediate, I still do some twittering. Seriously, W T F ? ? They held her for 2 years before she could reunite with the rest of her pride. But an animal? Geeeeeez. Religious, nutcases. It is nice to have these clip and look back on. To me, this is bliss. Here is the next 30 sec. Incognito tagged me and for some maaaaad reason wanting to know 7 more facts about me. 1. I love the smell of plastic, like when you hang up a new shower curtain (like I did today) and I loooooove that smell. 2. My political view covers the whole spectrum – different for each topic. My strongest viewpoint is Freedom of Speech – however it does not stretches to those who speak against this Freedom. A paradox that is logical to me. 3. I don’t know where my home is. I do not have one place that I can call home to 100%. The longest I have lived at one place is 7 years. I do the test “Where would I like to be buried?” Answer: I have no idea. 4. I believe strongly that religion is root to much of the evil of the world, which is a paradox in itself. The secularism right way forward. 5. I am a tidy person and like my routines. 6. My attention span was broken years ago, and I don’t know how to fix this.